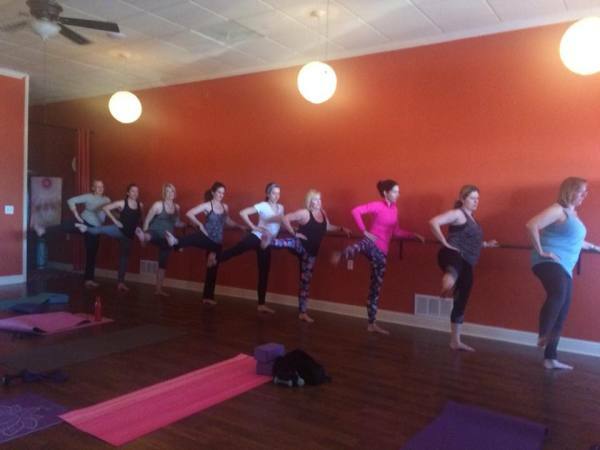 You will be led through a series of postures all focusing on the booty while improving your balance. The flow of postures chosen for this session will help lift the booty, creating long lean muscles not bulking up the thighs. Restorative yoga, gentle stretches while smoothly coming into gentle warrior postures. Great practice to engage both the mind and body. Good for the beginner and the more advance. Everyone needs the calmness and stretching this class provides. Similar to calm yoga adding a little flow sequence. There’s a reason we crank the heat: to sweat. Sweating is one of the best ways to eliminate toxins from the body. The more water you drink, the more you sweat. The more you sweat, the more you detoxify. It’s like taking a shower from the inside out—resulting in a body that is clean and pure after every practice. The skin is the largest organ of the body and therefore sweat is the fastest way to get the toxins out. That is why we embrace the heat. Another method of detoxification is compression. Many yoga postures are specifically designed to compress vital organs and manipulate the blood flow, first to restrict the blood and then to flush it out. This is done through compression—engaging muscles that are located near major organs and then releasing. This also prevents build up and blockages that can lead to fatigue, illness, injury and disease. Strengthen your core while never leaving the mat. We will work on abs, arms and the bottom line all from the mat. 30 minute class. Starts with body awareness. You will improve physical strength, flexibility and posture and enhance mental awareness. Perfect class to strengthen and tone the core. Yin yoga postures are held from 3 to 5 minutes. Stillness is created from within. Helps increase circulation within the joints and gain flexibility. Vinyasa is a style of yoga characterized by stringing postures together so that you move from one to another, seamlessly, using breath. Commonly referred to as “flow” yoga. The variable nature of Vinyasa Yoga helps to develop a more balanced body as well as prevent repetitive motion injuries that can happen if you are always doing the same thing every day. This practice starts with a vinyasa flow. Flowing from one poses to the next with the breath. You will end your practice with yin yoga. Holding each pose from 3 to 5 minutes. Each posture is a floor posture to give the body a great stretch getting into the connective tissue. You will end the practice connected to your body and mind. This class is intended to help you live better in your body using a combination of yoga, corrective exercise, self-massage, breath strategies and mindset approach. Awaken your internal senses to help you feel and heal your own body from within. This class will focus on areas that are commonly overused, underused, misused or abused resulting in aches, pains and injury. Improve posture and restore balance with this unique approach to yoga. The trapeze is made out of a parachute-like material. The fabric itself has very little to no stretch, helping you to feel supported while positioned inside. It features three levels of handles, perfect for building grip strength or using to pull up, down or while flipping! 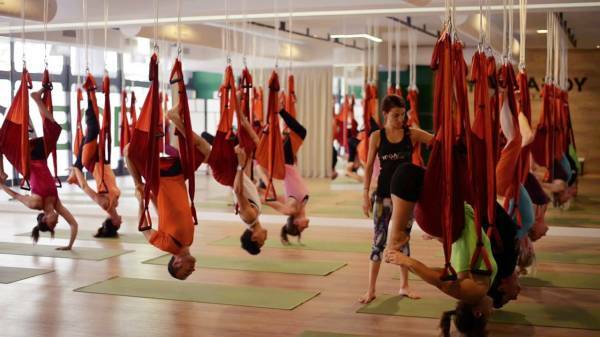 Any yoga trapeze class will offer an excellent strength building workout and tons of spinal traction that will leave you craving more. 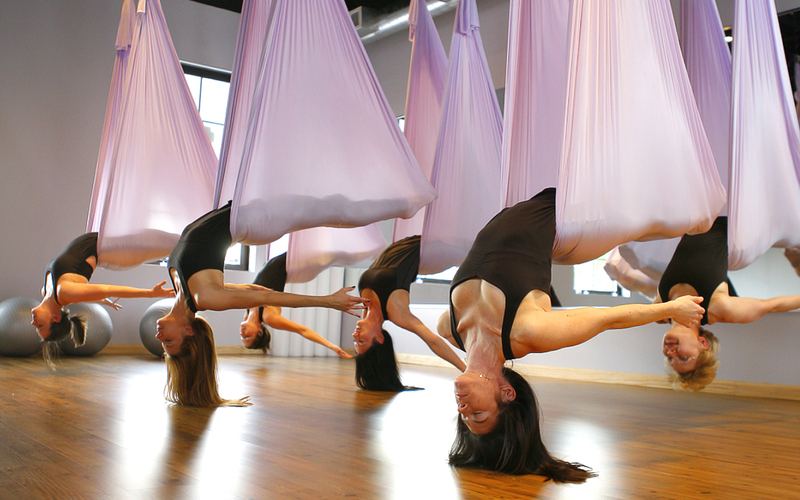 Aerial Yoga is an artistic fusion of traditional yoga, pilates, suspension fitness and aerial arts that integrates mindfulness into a beautiful physical practice. The stretchy, silky material of the hammock assists well with mobility, and provides the chance to explore postures more deeply than traditional mat yoga leaving the practitioner feeling decompressed from head to toe. This comprehensive fitness class will focus on movement linked to breath, soft inversions and physical agility all while having fun and flying free! Leave feeling light, magical and rejuvinated in your entire being.